Oxygen isotope composition of the final chamber of planktic foraminifera provides evidence of vertical migration and depth-integrated growth Oxygen isotope composition of the final chamber of planktic foraminifera Hilde Pracht et al. The translation of the original seawater signal (i.e. ambient temperature and δ18Osw) into distinct chambers of a single shell of a foraminifer during calcification can influence our interpretation of surface ocean conditions of the past, when based upon oxygen and carbon stable isotope geochemistry. In this study three different hypotheses were tested to gain more insight into biological and ecological processes that influence the resultant composition of stable isotopes of oxygen (δ18O) in the shells of planktonic foraminifera. These hypotheses were related to the shell size; the differences in isotopic composition between the final chamber and the remaining shell; and the differences between different species. Shells of Trilobatus sacculifer, Globigerinoides ruber white and Neogloboquadrina dutertrei were picked from the top of multi-core GS07-150-24, of modern age, offshore of north-eastern Brazil (3∘46.474′ S, 37∘03.849′ W) and analysed for single-shell and single-chamber stable isotope analysis. We show that the mean value of δ18O of the final chambers (δ18OF) is 0.2 ‰ ± 0.4 ‰ (1σ) higher than the mean value δ18O of the test minus the final chamber (δ18O<F) of T. sacculifer. The formation of the final chamber happens at temperatures that are approximately 1 ∘C cooler than the chambers formed prior, suggesting both ontogenetic depth migration to deeper water and a potential offset from the surface signal. Furthermore, we show that there is no statistical difference in the δ18Osacculifer values of shells of three different size classes of T. sacculifer, although the pattern between the different size classes indicates depth migration during the life and growth of T. sacculifer. Comparison of vital effect corrected δ18Oshell between T. sacculifer, G. ruber white and N. dutertrei suggests that G. ruber has a slightly shallower depth habitat (∼90–120 m) compared to the other two species (∼100–130 m). Disentangling depth vs. seasonal habitat is complicated given the commonality between isotope values from similar depths but different seasons; for instance, the same average isotope value will have a shallower depth habitat in May than September. Calculation of seasonal-depth habitat was therefore tested. Our results highlight the complicated nature of interpreting oxygen isotopes even for the modern record. 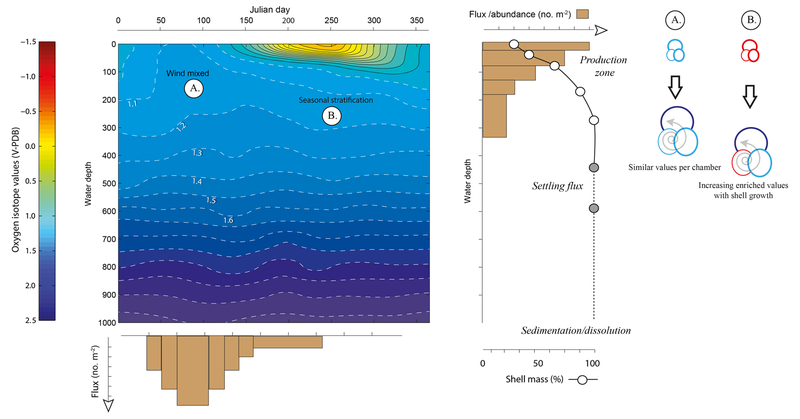 Pracht, H., Metcalfe, B., and Peeters, F. J. C.: Oxygen isotope composition of the final chamber of planktic foraminifera provides evidence of vertical migration and depth-integrated growth, Biogeosciences, 16, 643-661, https://doi.org/10.5194/bg-16-643-2019, 2019. Figure 1Schematic to show the competing individual and population dynamics that may contribute to the variance within the δ18O of a population. Growing seasons may be exaggerated or minimized by water column properties (i.e. rapid population turnover reflecting “bloom” conditions) as highlighted by the uneven widths of the flux histogram. Likewise, rapid growth during juvenile chamber formation may lead to larger offsets (Berger et al., 1978a; Mulitza et al., 1999a) as well as large differences between the surface and deep equilibrium δ18O; however, this is offset by the percentage that these juvenile chambers contribute to the whole shell δ18O. This is particularly influential if scenario B (a stratified water column) occurs rather than scenario A (a well-mixed water column). Schematic modified from Metcalfe et al. (2015). The oxygen isotope ratio in the shells of planktonic foraminifera (δ18Oshell) is used to reconstruct changes in water properties of the upper water column (e.g. temperature, salinity, stratification) as well aid in palaeoclimatological reconstructions (e.g. defining water mass characteristics, global ice volume). Understanding how this ratio is translated from the ambient environment into the shells of individual foraminifera is therefore important to aid reconstructions and reduce the uncertainty in reconstructed parameters. The δ18Oshell values recorded are a product of the temperature and the isotopic composition of seawater (δ18Osw), itself a product of the evaporation and dilution (e.g. precipitation, riverine runoff and ice melt) of seawater and hence directly correlated with salinity, which is further modulated by species-specific preferences and metabolic effects (i.e. vital effects). Reconstructions often utilize δ18O produced from a number of pooled specimens, without reconciling how this impacts sample heterogeneity and therefore the resultant climatic interpretation (Fig. 1). Assuming minimal disruption from sedimentary processes such as dissolution (McCorkle et al., 1997) or bioturbation (Hutson, 1980; Lougheed et al., 2018; Löwemark, 2007; Löwemark and Grootes, 2004; Löwemark et al., 2008; Trauth et al., 1997), the variance associated within a pooled δ18O value is a product of the life histories of each individual that comprises the single measurement (Lougheed et al., 2018; Shackleton, 1967) and the underlying biological and ecological controls that govern such “individual” depth distribution within the water column and seasonal occurrence (e.g. Peeters et al., 2002; Schiebel and Hemleben, 2017). Figure 2Representatives of species used within this study. Light microscope from core top location and scanning electron microscope (SEM) images used to highlight particular features were collected using plankton tows and plankton pumps from the Arabian Sea during the NIOP cruise (Peeters, 2000; Peeters et al., 2002). Note that this final sac-like chamber of Trilobatus sacculifer has various unique morphologies, including a thinner walled variety giving the specimen's F chamber a translucent quality (similar to i and vi). The species Globigerinoides ruber has two morphotypes referred to as (xi–xii) senso stricto (s.s.) and (viii–x) senso lato (s.l. ), whilst Neogloboquadrina dutertrei is distinguished from other species of Neogloboquanids by the presence of a “tooth”. In this paper we present the results of a number of experiments using single shells and dissected parts of single shells of planktonic foraminifera. Analysis of small quantities has been made possible with advances in techniques aimed at the routine measurement of microvolume amounts of CO2 (Feldmeijer et al., 2015; Ganssen et al., 2011; Ishimura et al., 2012; Metcalfe et al., 2015; Scussolini et al., 2013; Takagi et al., 2015, 2016; van Sebille et al., 2015; Vetter et al., 2017; Wit et al., 2010, 2013). In order to evaluate the ecological and physiological impacts on the stable isotope values of foraminifera, three species of planktonic foraminifera (T. sacculifer; G. ruber white and N. dutertrei; Fig. 2) were picked from a modern core top sample from the Tropical Atlantic Ocean (Fig. 3). Given its gross morphology, in which individual chambers can be “cleanly” dissected with minimal interference from other chambers (Lougheed et al., 2018; Shuxi and Shackleton, 1989; Spero and Lea, 1993; Takagi et al., 2015, 2016), several experiments were first performed on T. sacculifer (Fig. 2i: vii). These experiments focused upon: (1) the differences between successive chambers (Lougheed et al., 2018; Shuxi and Shackleton, 1989; Spero and Lea, 1993; Takagi et al., 2015, 2016); (2) the size–isotope relationship of foraminifera, expanding upon Metcalfe et al. (2015) and Feldmeijer et al. (2015) and (3) the difference in the variance between species. In the section below, we address three fundamental questions related to the oxygen isotope ecology of planktonic foraminifera. In the first question we aim to find out whether there is evidence for depth integrated growth of calcite in a surface-dwelling species. In the second experiment we focus on the question whether shell size and oxygen isotope composition are correlated. Finally, for the third experiment, we investigate whether the oxygen isotope composition of shells of different species from the same geographic location share the same variability. 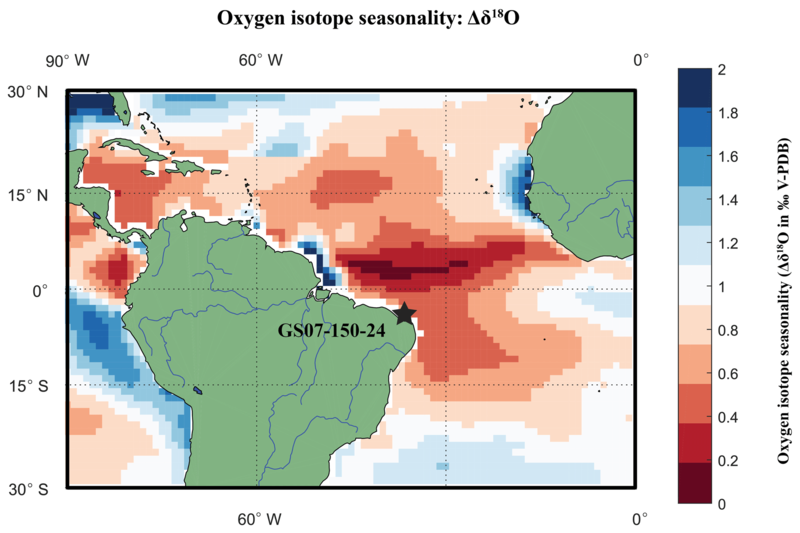 Figure 3Location Map of RETRO multi-core GS07-150-24 plotted on a basemap of sea surface δ18Oeq seasonality. Location of multi-core (black diamond) plotted on a seasonal oxygen isotope equilibrium (Δδ18O) basemap, calculated by subtracting the maximum and the minimum (δ18Oeq) of WOA13 temperature and salinity data converted into input variables for a rearranged (Kim and O'Neil, 1997) equation. Core location has an estimated Δδ18O of 0.6 ‰. Note that the coastline basemap of WOA13 is of a far lower resolution than Mathworks MatLab® 2016 Mapping toolbox; thus, white areas around the coast represent a lack of data. 1.2.1 Question 1. Do individuals belonging to the species T. sacculifer calcify at one specific depth or undergo depth migration? 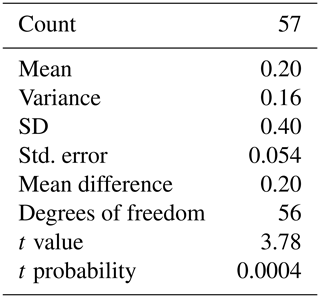 By computing the difference and using a reference value of 0, we do not invalidate the rule of independence that a two-sample Student's t-test would require between the two sample populations. This dependence is based upon the inference that μF and μ<F could conceivably be considered to be “before” and “after” measurements, and thus the value of μ<F could have an impact upon the value of μF. 1.2.2 Question 2. Does the δ18Oshell of T. sacculifer covary with size? H0:μδ18Osmall=μδ18Omedium=μδ18Olarge,(2)H1:at least one of the means is different from the others. 1.2.3 Question 3. Do different species of planktic foraminifera from the same geographic location share the same single-specimen δ18Oshell variability? In addition to the ANOVA test for testing multiple means, we use a Kolmogorov–Smirnov (K–S) test to test whether the species stem from a similar δ18O distribution, with the claim in the null hypothesis being equal (i.e. not significantly different) distributions. Three tests were carried out: T. sacculifer vs. N. dutertrei, T. sacculifer vs. G. ruber and N. dutertrei vs. G. ruber respectively. For Objective 3, the hypothesis is that the δ18Oshell variability varies for different species from the same location, which would mean that different species from the same location can give a different temperature and/or seasonality derivation (Mix, 1987; Roche et al., 2018). Overall, the hypothesis is that different processes cause deviations from the sea surface equilibrium. More insight into the presence and size of these deviations can possibly be used to account for future climate reconstructions. Multi-core GS07-150-24 was collected on board the RV G.O. Sars at a depth of 2412 m offshore of north-eastern Brazil (3∘46.474′ S, 37∘03.849′ W; Fig. 3). Following sub-sampling, the top of the core was washed over a >63 µm sieve, dried overnight, before being dry sieved over a 150 and 500 µm mesh. Regardless of the research question, each specimen underwent the same methodological protocol which aims to reduce uncertainty (e.g. specimen misidentification; anomalous or abnormal features) within single-shell stable isotope analysis by cataloguing morphology and physical features of specimens prior to destructive analysis. After picking, the selected specimens were given a unique identifier, imaged in the umbilical position (Fig. 2) using a Nikon Digital Research microscope with a prior motorized stage. The motorized stage enables multiple images to be taken at pre-determined intervals in µm. These images were then combined using Nikon Digital Research D software into an extended depth of focus (EDF) image. Each EDF image was then used to measure the diameter and surface area of both the final chamber and the whole shell, using the same programme. Groups of specimens were imaged together, with little impact upon the resolution (1 pixel, depending on the magnification, is equal to 0.3 to 1.5 µm) and placed into individual slides in order to generate a high throughput. After imaging, specimens were weighed individually in tin capsules using a Mettler-Toledo UMT microbalance (manufacturers precision 0.1 µg). In total 207 specimens of T. sacculifer were picked, weighed and measured for size. Following these measurements, specimens selected for research questions 1 (δ18O difference between F and <F) and 2 (δ18O difference between size) underwent additional steps, outlined in Sect. 2.2 (dissection of chambers) and Sect. 2.3 (size fractions), prior to stable isotope analysis. For δ18O and δ13C analysis, shells and/or single chambers between 5 and 70 µg were placed in a 4.5 mL borosilicate exetainer vial, whereas shells between 20 and 145 µg were placed in larger 12 mL borosilicate exetainer vials (Breitenbach and Bernasconi, 2011; Feldmeijer et al., 2015; Metcalfe et al., 2015). Each vial was sealed with a cap with a pierce able septum, placed in a heated block (45 ∘C), before being flushed with helium for 3 or 5 min to remove the ambient air (flow rate >100 mL min−1) depending on the size of the vial. Each sample was reacted with a few drops of phosphoric acid (H3PO4) for 160 min, transferred using a continuous flow of helium into a GasBench II preparation device, in which impurities were removed, before being introduced into a Thermo Delta+ mass spectrometer. Results were reported as δ values in per mil (‰), following voltage correction of the amplitude of mass 44 using grains of 150–180 µm of Vrije Universiteit Internal Carbonate Standard (VICS: δ18O=-5.44 ‰; δ13C=1.35 ‰) in order to be placed on the V-PDB scale. The precision of within-run international standards of IAEA-CO-1 and IAEA-CO-603 (minimum n=10), placed to book-end every 6 samples, was better than 0.14 ‰ for both δ18O and δ13C. Shell size, weight and stable isotope data are available online (Pracht et al., 2018). where the amplitude is the amount of CO2 of mass 44 produced in mVolts, which is linearly related to sample weight. To make inferences about the effect of size on the measured isotopic composition (Research Question 2), 41 whole shells of T. sacculifer were picked from the >150 and >500 µm size fractions and subdivided based upon measured size. Three size classes were determined: small: 222–316 µm (n=10); medium: 373–467 µm (n=16); and large: 511–597 µm (n=15). The size classes have uneven widths with ranges of 94 µm, 94 and 86 µm respectively. All δ18Oshell values of G. ruber and T. sacculifer, irrespective of size, were corrected for their vital effect. To determine whether species of planktonic foraminifera from the same geographic location share the same or similar single specimens, δ18Oshell variability specimens of G. ruber (n=20) and N. dutertrei (n=14) were picked from the same interval. These shells underwent the same methodology outlined in Sect. 2.1 for photographing, weighing and isotope analysis. Here, Kim and O'Neil (1997) is used to define an inorganic equilibrium value of δ18Oc this equation is chosen to avoid potential differences due to (1) light level; (2) foraminiferal size; (3) ontogenetic level (Bemis et al., 1998, 2000); and (4) species (Mulitza et al., 1999b). To account for similar absolute measured values between species which are not produced by concurrent depth or seasonal preferences between species but instead by species-specific disequilibria from values obtained from ambient seawater equilibrium (so-called “vital effects”) a correction was applied. The δ18O values of T. sacculifer and G. ruber were corrected by 0.48 ‰ (1σ=0.15 ‰; Peeters, 2000; Peeters et al., 2004). To understand the results, a probabilistic determination of the seasonal-depth distribution using a fitted normal distribution to the single-specimen data was calculated by fitting the probabilities of δ18Oshell to the seasonal and depth distribution of δ18Oeq. Fitting was accomplished using a normal distribution; therefore, to test whether the data come from a normal distribution, a K–S test (data normalized first) and an Anderson–Darling test were performed. The probability determined for each δ18Oshell is then transposed onto the δ18Oeq of the core top. To aid the reader, the stable isotope values in the following section are reported to two or three decimal places to report the results of the statistical tests without introducing rounding errors; this should not be misconstrued as reflecting a greater degree of certainty in the isotope values after the decimal point. During the picking and selection process, a total of 207 specimens of T. sacculifer was measured and weighted. Ninety-eight of these were eventually analysed for stable isotopes; however data on size and weight for all 207 specimens were processed to make interferences about the relation between these two parameters (Fig. 4). For comparison, the measured size and weight data were plotted alongside a theoretical hollow foraminifer (similar to Orbulina universa) in which the shell weight is calculated by assuming a constant porosity and the density of calcite is 2.71 kg−1 m−2. This approach highlights the complexity when dealing with foraminiferal weight when both chamber number and chamber wall thickness is variable, there is a clear increase in the spread in shell weight (Fig. 4a) when the area is larger than 4×105 µm2 this is likely either the result of chamber thickening or non-linear growth of the foraminiferal shell. After completion of the first chamber, during the construction of subsequent chambers of a Rotaliid foraminifer an additional layer of calcite is added to the previous chambers, making them a incrementally thicker. This makes the weight increase deviate from a linear relation and also makes that the final chamber has less thick (and therefore lighter) walls than its predecessors (Bé and Lott, 1964). Regarding shell size vs. shell weight, a heteroscedastic relation was found. For smaller tests, little variance was present, deviation from the regression line increased when the area of the test increased, indicating more variability in shell weight for bigger shells. A possible explanation can be found in the fact that when shells grow larger, they tend to get more divergent or erratic forms (Fig. 4a), this especially goes for the final chambers. A relatively low weight in large specimens is then caused by a relatively large F chamber. Because the F chamber has a relatively thin wall and therefore a low weight, the shell of large specimens is lighter than expected (Bé and Lott, 1964). A relatively high weight in large specimens is caused by a big <F and small F. The chambers of <F have thicker walls and therefore a relatively high weight, causing a positive deviation from the size-weight regression line. A heteroscedastic relation also appeared between the area of the final chamber and the area of the whole shell. In Fig. 4b it is visible that when the area of the whole shell size increases, the variance becomes bigger. Large specimens often have disproportionally large or small final chambers, with no clear relationship between total shell size and the size of the final chamber. Compared to smaller shells, big shells tend to have relative small or big final chambers, which are not in proportion with the shell. Figure 4Physical properties of T. sacculifer. (a) Size vs. weight of T. sacculifer; the data are overlaid on a theoretical calculation of what the shell weight would be of a spherical hollow foraminifer with consistent porosity, assuming the density of calcite. Colour represents variation in wall thickness used to calculate the difference between the inner and outer sphere volume. (b) The area of the final chamber vs. the whole shell area of specimens measured, pictures inset highlight the morphology associated with the spread in the datasets. The scatter points filled colour reflects the ratio between the maximum ferret diameter with and without the last chamber. The linear regression equation is y=0.0002x-4.5243 (r2=0.8985; n=207). Figure 5Final chamber vs. rest of shell δ18O. (a) Raw δ18O values of rest of shell (blue) and final chamber (red) plotted as a histogram, vertical bars represent sample means. Fitted normal distributions for rest of shell (μ<F; blue) and final chamber (μF red), with mean average values are also indicated. Histogram bins are in 0.25 ‰ bin intervals, the equivalent of ∼1 ∘C depending on whether the data are on the high or low end of the scale. (b) Histogram of the same specimen difference in δ18O (≡Δδ18O) between <F and F. Vertical green lines at Δδ18O of ±1 ‰ represent a ∼4 ∘C temperature variation, a vertical red line denotes no difference (Δδ18O=0). The average Δδ18O (μ=0.203) is shown as a black vertical line. (c, d) Scatter plot of the same data plotted as either the (c) <F remaining of the shell and (d) the F chamber δ18O vs. Δδ18O. Vertical error bars represent the square root of the sum of the error's squared ErrorA2+ErrorB2 and the horizontal a single machine error. Blue line is the linear regression and the blue a confidence interval on the regression. All values in per mil (‰) on the V-PDB scale. Measured δ18O values are plotted as a histogram in Fig. 5a for δ18O<F and δ18OF. The mean δ18O values for the final chambers and the shells without final chambers, were δ18OF‾=-1.234 ‰ and δ18O<F‾=-1.437 ‰ respectively, indicating the means of the two groups differ by approximately 0.203 ‰, with the final chamber having a more negative value than the shells without the final chamber. In Fig. 5b, a histogram of Δδ18O, which represents the difference between δ18O<F and δ18OF is shown. The data are normally distributed, with a mean (difference) of +0.23 ‰ (Table 1). The one-sample t-test results in a p-value of <0.05, therefore the null hypothesis can be rejected at a significance level of α=0.05, and it is possible to conclude that the Δδ18O is statistically different from 0. In other words, the difference between final chamber δ18O and the δ18O value of the shell with the last chamber removed, is positive and significantly different from zero at the 95 % confidence level. The positive value indicates that growth of the final chamber occurs, on average, at a lower temperature. A scatter plot between Δδ18O and δ18O<F (r=0.61; n=57); and δ18OF (r=0.69; n=57) shows that there is a statistically significance between the variables (Fig. 5c and d). The significance of r being non-zero was statistically tested using Pearson's correlation coefficient. The critical value for the absolute value of the correlation coefficient for an α of 0.05 where n=50 is 0.273 and n=60 is 0.250. Our n (=57) taking into account the number of degrees of freedom (d.f. = n−2) lies between these values of n. Since our correlation coefficients are higher than these critical values, it is possible to conclude that they are different from zero. The correlation coefficients are also significant for an α of 0.01 (C.V. = 0.354; for d.f. = 50). Table 1Results of the Student's t-test for a single group. Testing the δ18OF-δ18Oshell-F. Test value: 0 (testing whether the difference between δ18OF and δ18Oshell-F is statistically equal to 0). Figure 6Box plots of the oxygen isotope values (δ18O) vs. size and for different species of planktonic foraminifera. (a) Small, medium and large (see the text for definitions of sizes represented; note the uneven size interval). (b) The (right-hand side) box plots are the range in oxygen isotopes corrected for vital effects (circles with arrows) calculated from in situ water sampling (plankton pump and plankton tow; Frank Peeters, unpublished data). The central bar of each box represents the median. Table 2Results of the ANOVA test for size fractions. Comparison of the means of the three different size classes: small, medium and large. The mean δ18O for the small, medium and large size fractions of T. sacculifer was −1.12 ‰, −1.30 ‰ and −1.15 ‰ respectively (Fig. 6; Table 2), with the smallest and largest shells having a less negative mean value than the medium shells. The resultant ANOVA test p-value of 0.136 (>0.05) however indicates that the null hypothesis of equal means cannot be rejected; the observed differences between the different size classes are therefore not enough to state that there is a statistically significant difference between the mean δ18Oshell of the small (222–316 µm); medium (373–467 µm) and large (511–597 µm) shells. 3.4 Question 3: similarity in species-specific variability for a single site? The mean δ18O of the single specimens of N. dutertrei, T. sacculifer and G. ruber were −0.84 ‰; −0.82 ‰ and −1.15 ‰ respectively (Fig. 6b; Table 3). An ANOVA to test whether the species had equal means resulted in a p-value of 0.0001 which led to a rejection of the null hypothesis (p<0.05) that the species have equal means. A post hoc Tukey all pair comparison, using vital effect corrected δ18O values, shows that the mean δ18Oshell of G. ruber differed significantly from both T. sacculifer (p=0.0004) and N. dutertrei (p=0.0017), whereas the difference between T. sacculifer and N. dutertrei was not significant (p=0.9492). Using the uncorrected, for vital effect (Table 4), δ18O values all species show statistical difference between one another. The range in species δ18O is less than 1 ‰, from largest to smallest the range of N. dutertrei (δ18Omin. : −1.33 ‰; δ18Omax. : −0.46 ‰; δ18Orange: 0.86 ‰) is larger than T. sacculifer (min. −1.20; max. −0.39; range: 0.81 %) and G. ruber (min. −1.55; max. −0.78; range 0.76) (Fig. 6b). However, for three F-tests, to determine whether the species has equal variances, the resultant F-value is less than the F-test critical value and therefore the null hypothesis that they have equal variances could not be convincingly rejected with the data measured. A Kolmogrov–Smirnov test was used to test whether the three species come from the same distribution, which would indicate the three species have recorded the same climate signal. Three tests were carried out, each comparing the distributions of two species at the time. 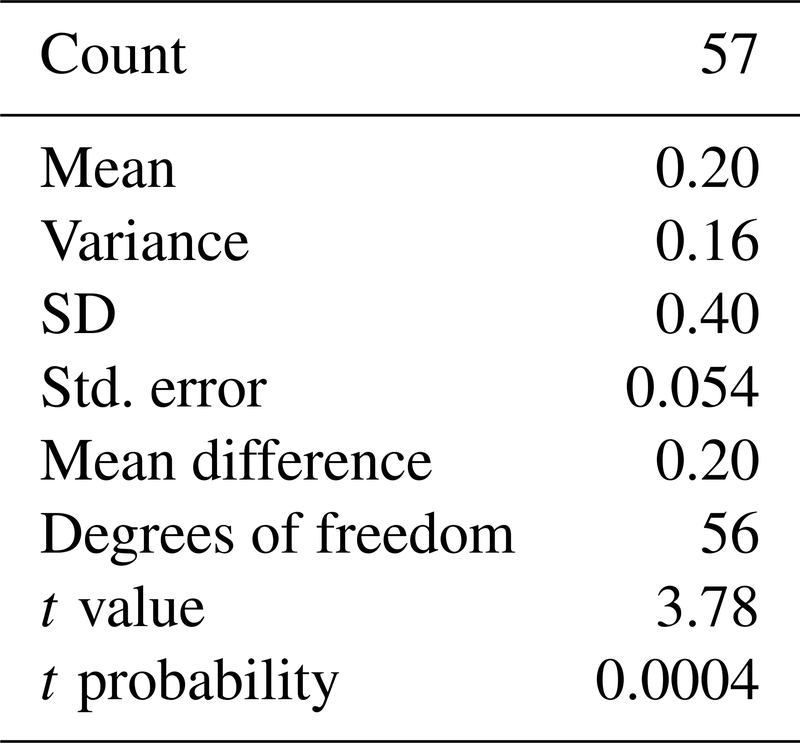 The test comparing T. sacculifer and N. dutertrei, resulted in a p-value of 0.9697 (α=0.05), meaning it is unable to reject the null hypothesis. This means that we found no evidence that the two species have a different probability distribution. For N. dutertrei vs. G. ruber (p=0.012) and T sacculifer vs. G. ruber (p=0.030), the null hypothesis however could be rejected; therefore, the two species record significantly different variability in δ18O. Table 3Results of the ANOVA test comparing the means of the three different species corrected for vital effect: T. sacculifer, G. ruber and N. dutertrei. Table 4Results of the ANOVA test comparing the means of the three different species uncorrected for vital effect: T. sacculifer, G. ruber and N. dutertrei. Figure 7Season or depth, predicting likely depth habitats of planktonic foraminiferal species using inferred equilibrium oxygen isotope values (δ18Oeq). World Ocean Atlas (WOA13) temperature and salinity were used to compute the equilibrium oxygen isotope value using the tropical Atlantic δ18O–salinity relationship defined by LeGrande and Schmidt (2006) input into a rearranged form of Kim and O'Neil (1997) (see Sect. 2.4). (a) Contour plot of δ18Oeq, plotted as depth in metres vs. day in year. Note the uneven depth interval distribution inherent within the WOA dataset. Black arrows represent depths chosen in (c) to calculate cumulative distribution, species symbols represent inferred depths of mean average values. (b) The seasonal minimum and maximum (grey band) in δ18Oeq for each depth interval, coloured bars represent depth intervals that are similar to isotopic values of the three species. (c) Cumulative density distribution of the three species plotted alongside the CDF for 20, 100, 125 and 150 m distributions; values are plotted as probability (F(x)) vs. oxygen isotope value. All values plotted in per mil (‰) on the V-PDB scale. Numerous studies have subdivided the species T. sacculifer into the forms with a distinct final chamber, referred to as “sac-like”, from “non-sac” forms referred to by its junior synonym G. trilobus. The division between these forms is not exclusively for studies with geochemical analysis but is also commonly found in studies using faunal abundance counts. In fact, a number of studies where T. sacculifer is used as a proxy for palaeoclimate have removed the final chamber to avoid potential bias caused by the assumed depth migration (Coadic et al., 2013). In our results we show a mean difference of approximately 0.203 ‰ between δ18OF and δ18O<F, i.e. those forms that would be described as T. sacculifer and those as G. trilobus, with <F having more negative values (δ18O<F‾=-1.437 ‰) than F (δ18OF‾=-1.234 ‰). A number of species of foraminifera, including the species analysed here (Bird et al., 2018), are associated with symbiotic algae that undergo diurnal migration into and out of the shell and vacuoles in the foraminifer's cytoplasm, a major function is their facilitation of both growth and longevity of an individual foraminifer (Anderson and Be, 1976; Bé et al., 1982; Caron et al., 1982; Faber et al., 1988, 1989; Gastrich, 1987; Hemleben et al., 1989; Spero and DeNiro, 1987; Spero and Lea, 1993; Spero and Parker, 1985). As such the presence of symbionts places limits upon the range of depth habitat: juvenile foraminifer must either be re-infected by or capture new symbiotic algae (Hemleben et al., 1989; Spero, 1998) whilst adult foraminifera with symbiotic associations would do well to remain within the photic zone. Using the mean δ18Osw of the sample location of 0.42 ‰ (WOA13; Boyer et al., 2013) and the mean δ18O of F and <F respectively, mean temperatures of 24.5 and 25.5 ∘C were derived which indicates a potential mean depth below and above 100 m respectively. The euphotic zone depth varies both regionally and temporally, from a lower limit of 20 m to greater than 120 m globally, with measured sites displaying variability between <40 to >100 m on seasonal timescales (Buesseler and Boyd, 2009; Siegel et al., 2014). Spero (1998) reflecting on the evolutionary advantages for a species known to harbour symbiotic algae to calcify below the photic zone considered that there are none, and instead as planktonic foraminifera are at the mercy of ocean currents such specimens that reflect too deep growth (Lohmann, 1995) could represent descent or advection out of their suitable habitat range. In fact, our results highlight the complexity of the individual life histories of individual foraminifer like many species of (phyto- and or zoo-)plankton which are heavier than water (Huisman et al., 2002) their persistence within the upper water column, despite a sinking trajectory that should take them below conditions of light and nutrients sufficient for growth, may relate to turbulence and advection (Huisman et al., 2002; Margalef, 1978; Riley et al., 1949; Shigesada and Okubo, 1981; Sverdrup, 1953). Our results show that whilst the mean difference in δ18O, between F and <F, is weighted toward a colder signal within the final chamber, there are however a number of shells that record a warmer signal in the F chamber (n=8 for <-0.25 ‰; or n=16 for <0.0 ‰). Although the role of turbulence remains enigmatic (Davila and Hunt, 2001; Ruiz et al., 2004), with Margalef (1978) suggesting that favoured species (i.e. those with spines or bubble capsules) and size of specimens depend on whether turbulence is low or high, within a turbulent water column the overall population average may suggest a trajectory of a downward descent, whereas the descent of an individual shell may be much more complicated. Our results suggest that there is a difference between chambers F and <F; on average the formation of the final chamber occurs in water approximately 1 ∘C colder than the chambers formed prior, suggesting both ontogenetic depth migration to deeper waters and a potential offset from the surface signal. Figure 8Calculated δ18O probability (p(δ18O)). (a) Single-specimen isotope measurements for G. ruber, with a fitted normal distribution. (b) These data are used to produce a cumulative distribution function plot (CDF), with statistical output for an Anderson–Darling test, and a Kolmogorov–Smirnov test following data normalization (failure to reject the null hypothesis at the 5 % confidence suggests the data are not statistically different from a standard normal distribution, red line in plot). (c) In situ δ18Oeq values predicted from a regional-specific equation (LeGrande and Schmidt, 2006) and a rearranged form of (Kim and O'Neil, 1997) with WOA13 temperature and salinity values as input values. (d) Resultant calculated p(δ18O); the probability of each discrete δ18O is denoted as p(δ18O) mapped upon the δ18Oeq WOA13 values. The grey region represents the area between 0 m and the first probable depth that may have become overprinted during depth migration. The statistical significance between either chambers F δ18O and/or <Fδ18O, and the Δδ18O (Fig. 5c and d) could indicate that the environment in which the early chambers (<F) form determines the final chambers δ18O (Fig. 5c); the warmer SST (more negative δ18O values) specimens have a larger Δδ18O, which could indicate the specimen lived during stratified water conditions (Fig. 1, scenario B). Likewise, the colder SST (more positive δ18O values) specimens have a smaller difference; therefore, these specimens could represent those that live under mixed conditions (Fig. 1, scenario A). Specimens that show a warming between F and <F chambers could theoretically have calcified during a period of change, a transition from a stratified to a mixed (or vice versa) water column. 4.2 Difference between F and <F: an underestimation? The difference in the isotopic value between successive chambers may not depend solely on depth migration during ontogeny but may be altered by chamber thickening. Two types of chamber thickening are known to exist: a calcite crust seen in Neogloboquanids and Globorotalids; and gametogenetic calcite (GAM) seen in Orbulina universa and T. sacculifer. Whilst both types are produced at the end of the life cycle and therefore deeper in the water column, one is considered to represent low temperature thickening of the shell, and the other a pre-reproduction thickening of the shell. Thickening of the pre-existing chambers that compose a single shell in response to a particular environmental parameter or at the end of the life cycle may bias the resultant isotopic composition; depending on the water column structure and depth of the mixed layer (Fig. 1, scenarios A and B), the calcite produced in such a way may be indistinguishable isotopically from older chambers. Whilst the size of this bias induced by GAM may have been overestimated in the literature, for instance using cultures, Hamilton et al. (2008) showed that approximately 80 % of the shell material is pre-GAM; new evidence suggests that the Δδ18O between pre-GAM and GAM is ∼1 ‰ (Wycech et al., 2018). The same work suggests that GAM comprises 32 % to 44 % of T. sacculifer shells. Determining how many of the <F and F chambers are altered by GAM is complicated because GAM calcite precipitates on the outer “exposed” edges/margin of the shell; the amount of GAM relates to the surface area. Now, by removing the final chamber, a section of this surface area would not have been exposed during GAM formation. Therefore, the size of the over-printing is a product of both the amount of GAM calcite and the surface area exposed. Our results should therefore be considered as the minimum deviation between <F and F.
Figure 9Calculated δ18O probability (p(δ18O)). As per Fig. 8, with individual isotope values, CDF distribution, WOA13 δ18Oeq and resultant p(δ18O) but with T. sacculifer. The trends in size–isotope values have been grouped into what Berger et al. (1978) considered to be three types: “normal” showing enrichment with increased size; “reversed” showing depletion with increased size and “mixed” in which neither enrichment or depletion with increasing size occurs. From our data there is no statistical difference in the δ18O of the three different size classes, despite the appearance of a “mixed” signal, meaning there is absence of evidence to state that the δ18O of T. sacculifer is subjected to a size effect. Evidence from our final chamber comparison shows that individuals undergo depth migration. Berger et al. (1978) considered that such a scenario should result in a “normal” size–isotope trend; however, depth migration with size is not demonstrated in the δ18O of the distinct size fractions. Berger et al. (1978) further considered that the “mixed” trend poses a problem in the interpretation of δ18O solely in terms of depth migration. However, a study of population dynamics in the Red Sea indicate following reproduction at depth from the preceding generation, juveniles ascend in the water column to mature, where after these maturing foraminifera descend when reaching the reproductive size (Bijma and Hemleben, 1994; Hemleben and Bijma, 1994). How small forms would migrate from depth is unknown, although ascending particles due to low density do exist in the marine environment (Azetsu-Scott and Passow, 2004; Mari, 2008; Mari et al., 2007). This would lead the smallest shells to have calcite that was formed in deeper, colder waters, medium-sized shells to consist of calcite formed at the surface, in warmer waters and larger shells formed of calcite from deeper, colder waters. One caveat to such a scenario is that (Brummer et al., 1987, 1986) considered juvenile-neanic stages of the planktonic foraminiferal life cycle to be less than 100–200 µm, distinctly smaller than the shell sizes measured here. Peeters et al. (1999) have shown that the size frequency distribution associated with the adult population of numerous planktonic foraminiferal species is distinctly gaussian in shape and thus variance around the mean should be considered as “dwarfs” and “giants” (Berger, 1971), thus a mixed signal may reflect extra-seasonal growth. A point of caution with size–isotope trends is that (Metcalfe et al., 2015) previously showed that such trends can either be consistent down core (e.g. G. truncatulinoides) or varying (e.g. G. bulloides and G. inflata) and therefore upscaling one relationship either spatially and/or temporally may lead to erroneous results. Figure 10Calculated δ18O probability (p(δ18O)). As per Fig. 8, with individual isotope values, CDF distribution, WOA13 δ18Oeq and resultant p(δ18O) but with N. dutertrei. The comparison between the δ18Oshell values of the three species demonstrated that G. ruber (μ=-1.15 ‰) has a different mean δ18O value and a different δ18O distribution than either T. sacculifer (μ=-0.82 ‰) or N. dutertrei (μ=-0.84 ‰). Solving the palaeotemperature equations for each species using the mean δ18O values gives an equivalent temperature of 24.1 ∘C for G. ruber, 22.6 ∘C for N. dutertrei and 22.5 ∘C for T. sacculifer. This suggests a difference in depth habitat and/or season of growth between G. ruber and the other two species further highlighted by a comparison with the annual average and cumulative distribution functions (CDFs) for specific depths (Fig. 7b and c). Disentangling the signals of depth migration from seasonal habitat is complicated given the commonality between isotope values from similar depths and different seasons and vice versa. For instance, the same average isotope value will have a shallower depth habitat in May than in September. To illustrate this, at two specific depths (100 and 125 m; based on Fig. 6c), the δ18Oshell of the foraminifera, corrected for the vital effect, was compared to the δ18Oeq over the year for a number of discrete depth levels in the water column, to find out at which depth level(s) a given species could grow, assuming a uniform shell flux over the year (Fig. 7a). For N. dutertrei and T. sacculifer these potential depths and seasons of growth are similar, following from the fact that their mean δ18Oshell and δ18Oshell variability is not significantly different. It was found that T. sacculifer and N. dutertrei could potentially occur year-round at ∼125 and at ∼100 m from respectively August to December and February to June. G. ruber in its place reflects the year-round temperature at 100 m of depths and autumn/winter temperatures (August to December) at a depth of 125 m. Wit et al. (2010) stated that the variability within single-shell δ18O measurements could be a proxy for seasonality (Ganssen et al., 2011; Vetter et al., 2017), which was inferred from measurements of single species (G. ruber) for multiple core locations to test this inference. Here we tested whether different species are influenced by seasonality in a similar or dissimilar way. Our results imply that species can be used as indicators of year-round seasonality, because the variability in single-shell δ18O matches the variability in annual temperature derived from the climatological average of WOA13, but only at species-specific depths (T. sacculifer and N. dutertrei for 125 m, and G. ruber for 100 m). 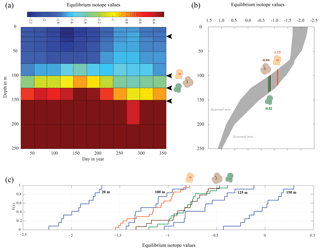 The probability plots of the season–depth habitat, as indicated by Figs. 8–10, show that the calcification depth recorded by the shell δ18O is a narrow interval between 50 and 200 m. Despite evidence to the contrary, δ18O does not implicitly record sea surface temperatures, collection of foraminifera by SCUBA (Bird et al., 2018; Spero, 1998) and net collection (Ottens, 1992; Kroon and Ganssen, 1989; Ganssen and Kroon, 1991) at or in close proximity to the sea surface represents a part of, but not their full, life cycle. This situation is further exacerbated by both a shallow or deep mixed layer giving a potential homogeneous δ18O signal from surface to deep (Fig. 1) and the unknown quantity of the vital effect when attempting to derive depths from core top material. It is worth reiterating, here, several conclusions of previous studies (Wilke et al., 2006). Foraminiferal depth habitat is a continuous variable from zygote fusion to eventual reproduction-induced mortality. However, chambers represent a distinct event covering a short period of time (∼12 h); the calcification depths of chambers therefore reflect discrete intervals along this continuous depth habitat. As chamber size increases progressively, in normal forms (Berger, 1969), from the earliest to the final chamber the contribution of each chamber to the cumulative signal increases iteratively and can be approximated by a mass balance (e.g. Wilke et al., 2006). As the shell sinks through the water column, during its life, the signal will become progressively skewed toward a deeper “colder” signal. Modification of this signal via crust formation or GAM calcite will bias the signal further toward higher δ18O and a colder signal. The depth habitat of foraminifera is not static globally; instead, its dynamism represents a complex interaction between food, temperature, water column structure and, where appropriate, light. Discrepancies between previously published work should not be considered in depth but on the various attributes of the water column present, as it is those parameters altering with depth that ultimately allow foraminiferal growth to occur. To gain more insight into biological and ecological processes that influence the δ18Oshell of planktonic foraminifera, three research questions with associated hypotheses were tested. First, we tested depth migration and found that a significant difference in δ18O between the final chamber (δ18OF, μ=-1.23 ‰) and the test minus the final chamber is observed in T. sacculifer. This difference in δ18Oshell is equal to a temperature difference of 1 ∘C, suggestive that the final chamber is formed via depth migration in waters that are approximately 1 ∘C cooler than the chambers formed prior. Second, we tested covariance with size and found that despite evidence for depth migration during the life and growth of T. sacculifer there is an absence for a size effect on T. sacculifer with no statistical difference in the δ18Oshell of the three different size classes. Third, we tested species-specific δ18O variability to quantify the effect upon the populations from proxy archives. Comparison between T. sacculifer (μ=-0.82 ‰), G. ruberwhite (μ=-1.15 ‰) and N. dutertrei (μ=-0.84 ‰) indicate that G. ruber has both a significantly different mean and variability in δ18O, suggestive that the species lives in warmer shallower waters (i.e. ∼90–120 m vs. ∼100–130 m). However, inferences about depth and/or seasonal habitat is complicated by the fact that similar δ18Oeq values occur in both time and depth. It is possible, based upon our results that T. sacculifer and N. dutertrei could potentially occur year-round at 125 m of depth and at 100 m of depth from respectively January to August and February to June. G. ruber in its place, reflects the year-round temperature at 100 m of depths, and autumn/winter temperatures (August to December) at a depth of 125 m. These results highlight the complicated nature of interpreting oxygen isotopes even for the modern record in line with previous findings (Kretschmer et al., 2018; Roche et al., 2018). Depth migration, size and species-specific variability all influence the values of δ18O within a foraminiferal shell and therefore the resultant palaeoclimate reconstructions conclusions drawn from their isotope values. The data produced and used in this research can be accessed online (https://doi.org/10.5281/zenodo.2476176, Pracht et al., 2018). FJCP and BM designed the study and HP performed data collection and analysis under supervision of BM and FJCP, upon material collected by FJCP. HP and FJCP performed statistical analysis. BM produced the figures. All the authors contributed to the writing of the manuscript. This work is a contribution to the RETRO project, a European Science Foundation (ESF)/EUROMARC project, jointly funded by research councils of the Netherlands (NWO), Norway (RCN), France (CNRS/INSU) and Germany (DFG). The captain and crew of R/V G. O. Sars and Chief Scientist Trond Dokken are thanked for the collection and sharing of research material. FP and BM wish to acknowledge sponsoring from the Netherlands Organisation for Scientific Research (NWO) open round project grant number NWO/822.01.0.19. The data and work presented here reflect work produced for the fulfilment of a VUA Earth Surface Processes, Climate and Records (ESPCaR) MSc Research Project (Hilde Pracht). SEM images in Fig. 2 produced by Saskia Kars (VUA) and Frank J. C. Peeters. Anderson, O. R. and Be, A. W. H.: A cytochemical fine structure study of phagotrophy in a planktonic foraminifer, Hastigerina pelagica (d'Orbigny), Biol. Bull., 151, 437–449, 1976. Bé, A. W. H. and Lott, L.: Shell growth and structure of planktonic foraminifera, Science, 145, 823–824, 1964. Bé, A. W. H., Van Donk, J., Hecht, A. D., and Savin, S. M: Oxygen-18 studies of recent planktonic foraminifera, Science, 173, 167–168, 1971. 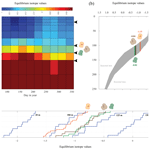 Bé, A. W. H., Spero, H. J., and Anderson, O. R.: Effects of symbiont elimination and reinfection on the life processes of the planktonic foraminifera Globigerinodies sacculifer, Mar. Biol., 70, 73–86, 1982. 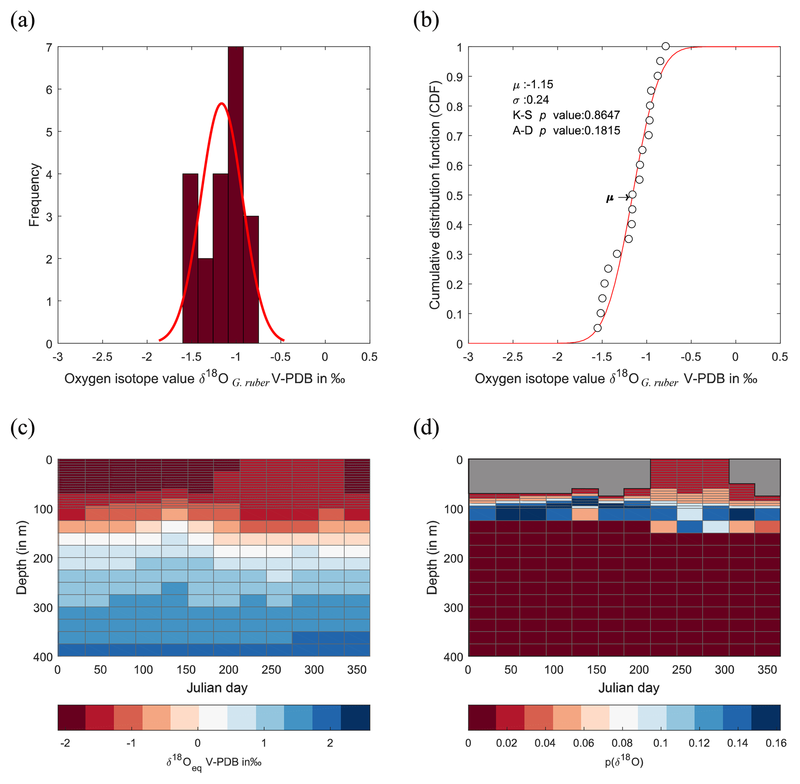 Bemis, B. E., Spero, H. J., Lea, D. W., and Bijma, J.: Temperature influence on the carbon isotopic composition of Globigerina bulloides and Orbulina universa (planktonic foraminifera), Marine Micropaleontol., 38, 213–228, 2000. Berger, W. H.: Kummerform Foraminifera as Clues to Oceanic Environments: Abstract, AAPG Bull., 53, p. 706, 1969. Berger, W. H.: Planktonic foraminifera: selective solution and the lysocline, Mar. Geol., 8, 111–138, 1970. Berger, W. H.: Sedimentation of planktonic foraminifera, Mar. Geol., 11, 325–358, 1971. Berger, W. H., Killingley, J. S., and Vincent, E.: Stable isotopes in deep-sea carbonate: Box Core ERDC-92, West Equatorial Pacific, Oceanol. Acta, 1, 203–216, 1978. Bijma, J. and Hemleben, C.: Population dynamics of the planktic foraminifer Globigerinoides sacculifer (Brady) from the central Red Sea, Deep-Sea Res. Pt. I, 41, 485–510, 1994. Bird, C., Darling, K., Russell, A. D., Fehrenbacher, J. S., Davis, C. V., Free, A., and Ngwenya, B. T.: 16S rRNA gene metabarcoding and TEM reveals different ecological strategies within the genus Neogloboquadrina (planktonic foraminifer), PLOS One, 13, e0191653, https://doi.org/10.1371/journal.pone.0191653, 2018. Boyer, T. P., Antonov, J. I., Baranova, O. K., Coleman, C., Garcia, H. E., Grodsky, A., Johnson, D. R., Locarnini, R. A., Mishonov, A. V., O'Brien, T. D., Paver, C. R., Reagan, J. R., Seidov, D., Smolyar, I. V., and Zweng, M. M.: World Ocean Database 2013, in: NOAA Atlas NESDIS 72, edited by: Levitus, S. E. and Mishonov, A. T. E., NOAA, Silver Spring, MD, 2013. Breitenbach, S. F. and Bernasconi, S. M.: Carbon and oxygen isotope analysis of small carbonate samples (20 to 100 µg) with a GasBench II preparation device, Rapid Commun. Mass Sp., 25, 1910–1914, https://doi.org/10.1002/rcm.5052, 2011. Brummer, G.-J. A., Hemleben, C., and Spindler, M.: Planktonic foraminiferal ontogeny and new perspectives for micropalaeontology, Nature, 319, 50–52, 1986. Brummer, G.-J. A., Hemleben, C., and Spindler, M.: Ontogeny of extant spinose planktonic foraminifera (Globigerinidae): A concept exemplified by Globigerinoides sacculifer (Brady) and G. ruber (d'Orbigny), Mar. Micropaleontol., 12, 357–381, 1987. Buesseler, K. O. and Boyd, P. W.: Shedding light on processes that control particle export and flux attenuation in the twilight zone of the open ocean, Limnol. Oceanogr., 54, 1210–1232, 2009. Caron, D. A., Bé, A. W. H., and Anderson, O. R.: Effects of variations in light intensity on life processes of the planktonic foraminifera Globigerinoides sacculifer in laboratory culture, J. Mar. Biol. Assoc. UK, 62, 435–451, 1982. Coadic, R., Bassinot, F., Douville, E., Michel, E., Dissard, D., and Greaves, M.: A core-top study of dissolution effect on B/Ca in Globigerinoides sacculifer from the tropical Atlantic: Potential bias for paleo-reconstruction of seawater carbonate chemistry, Geochem. Geophy. Geosy., 14, 1053–1068, 2013. Davila, J. and Hunt, J.: Settling of small particles near vortices and in turbulence, J. Fluid Mech., 440, 117–145, 2001. 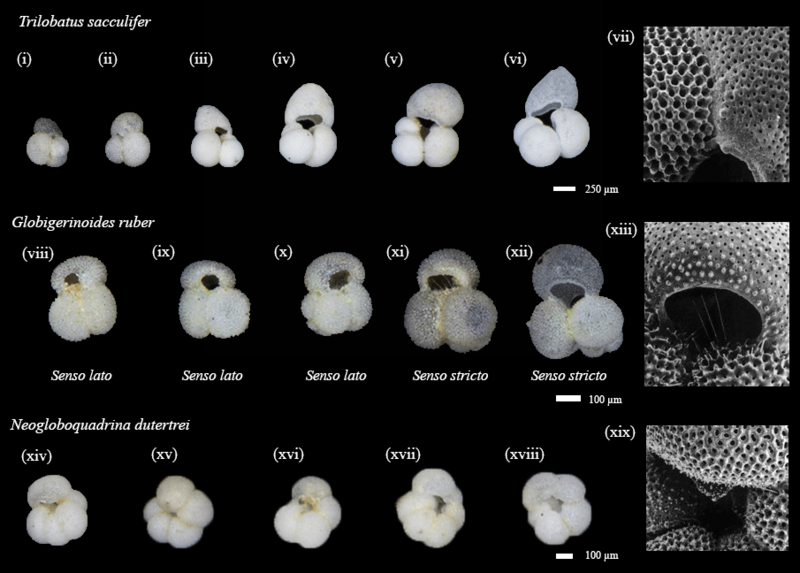 Duplessy, J.-C., Blanc, P.-L., and Be, A. W. H.: Oxygen-18 enrichment of Planktonic Foraminifera due to gametogenic calcification below the Euphotic Zone, Science, 213, 1247–1250, 1981. Emiliani, C.: Depth habitats of some species of pelagic foraminifera as indicated by oxygen isotope ratios, Am. J. Sci., 252, 149–158, 1954. Ezard, T. H. G., Edgar, K. M., and Hull, P. M.: Environmental and biological controls on size-specific δ13C and δ18O in recent planktonic foraminifera, Paleoceanography, 30, 151–173, 2015. Faber, W. W., Anderson, O. R, Lindsey, J. L., and Caron, D. A.: Algal-foraminiferal symbiosis in the planktonic foraminifer Globigerinella aequilateralis: I. Occurence and stability of two mutually exclusive chrysophyte endosymbionts and their ultrastructure, J. Foramin. Res., 18, 334–343, 1988. Faber, W. W., Anderson, O. R., Lindsey, J. L., and Caron, D. A.: Algal-foraminiferal symbiosis in the planktonic foraminifer Globigerinella aequilateralis: II. Effects of two symbiont species on foraminiferal growth and longevity, J. Foramin. Res., 19, 185–193, 1989. Feldmeijer, W., Metcalfe, B., Brummer, G. J. A., and Ganssen, G. M.: Reconstructing the depth of the permanent thermocline through the morphology and geochemistry of the deep dwelling planktonic foraminifer Globorotalia truncatulinoides, Paleoceanography, 30, 1–22, 2015. Ganssen, G. M. and Kroon, D.: Evidence for Red Sea surface circulation from oxygen isotopes of modern surface waters and planktonic foraminiferal tests, Paleoceanography, 6, 73–82, https://doi.org/10.1029/90PA01976, 1991. Ganssen, G. M., Peeters, F. J. C., Metcalfe, B., Anand, P., Jung, S. J. A., Kroon, D., and Brummer, G.-J. A.: Quantifying sea surface temperature ranges of the Arabian Sea for the past 20 000 years, Clim. Past, 7, 1337–1349, https://doi.org/10.5194/cp-7-1337-2011, 2011. Gastrich, M. D.: Ultrastructure of a new intracellular symbiotic alga found within planktonic foraminifera, J. Phycol., 23, 623–632, 1987. Hamilton, C. P., Spero, H. J., Bijma, J., and Lea, D. W.: Geochemical investigation of gametogenic calcite addition in the planktonic foraminifera Orbulina universa, Mar. Micropaleontol., 68, 256–267, 2008. Hemleben, C. and Bijma, J.: Foraminiferal Population dynamics and stable carbon isotopes, in: Carbon Cycling in the Glacial Ocean: Constraints on the Ocean's Role in Global Change. NATO ASI Series (Series I: Global Environmental Change), edited by: Zahn, R., Pedersen, T. F., Kaminski, M. A., and Labeyrie, L., Springer, Berlin Heidelberg, 145–166, 1994. Hemleben, C. and Spindler, M.: Recent advances in research on living planktonic foraminifera, in: Reconstruction of marine Paleoenvironments, edited by: Meulenkamp, J. E., Utrecht Micropaleontological Bulletins, 30, 141–171, 1983. Hemleben, C., Spindler, M., Breitinger, I., and Deuser, W. G.: Field and laboratory studies on the ontogeny and ecology of some globorotaliid species from the Sargasso Sea off Bermuda, J. Foramin. Res., 15, 254–272, 1985. Hemleben, C., Spindler, M., and Anderson, O. R.: Modern Planktonic Foraminifera, Springer-Verlag, New York, 1989. Huisman, J., Arrayás, M., Ebert, U., and Sommeijer, B.: How do sinking phytoplankton species manage to persist?, Am. Nat., 159, 245–254, 2002. Hutson, W.: Bioturbation of deep-sea sediments: Oxygen isotopes an stratigraphic uncertainty, Geology, 8, 127–130, 1980. 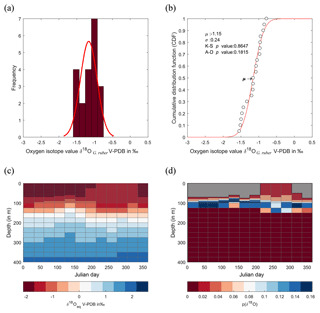 Ishimura, T., Tsunogai, U., Hasegawa, S., Nakagawa, F., Oi, T., Kitazato, H., Suga, H., and Toyofuku, T.: Variation in stable carbon and oxygen isotopes of individual benthic foraminifera: tracers for quantifying the magnitude of isotopic disequilibrium, Biogeosciences, 9, 4353–4367, https://doi.org/10.5194/bg-9-4353-2012, 2012. Jones, J.: The significance of the distribution of planktonic foraminifera in the Equatorial Atlantic Undercurrent, Micropaleontology, 13, 489–501, 1967. Kozdon, R., Eisenhauer, A., Weinelt, M., Meland, M. Y., and Nürnberg, D.: Reassessing Mg∕Ca temperature calibrations of Neogloboquadrina pachyderma (sinistral) using paired δ44∕40Ca and Mg∕Ca measurements, Geochem. Geophy. Geosy., 10, Q03005, https://doi.org/10.1029/2008GC002169, 2009a. 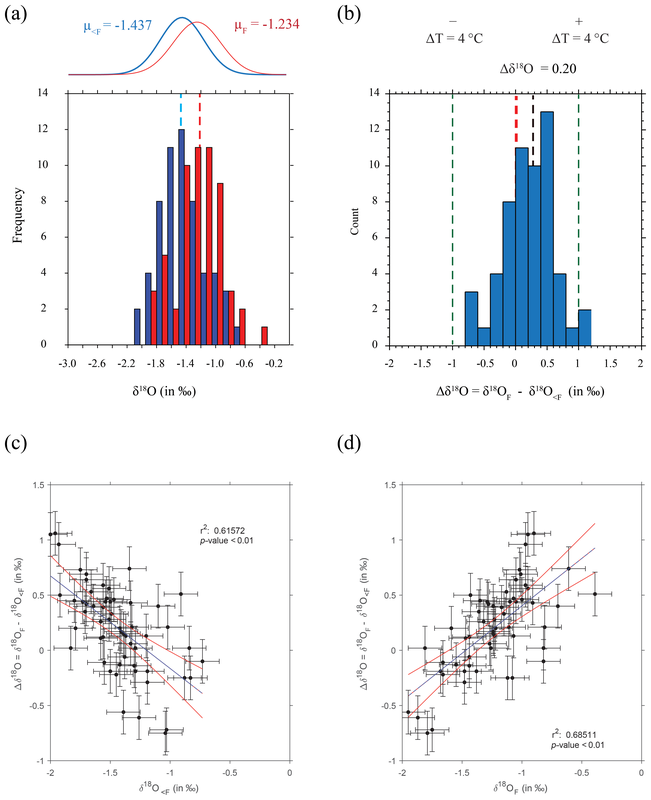 Kozdon, R., Ushikubo, T., Kita, N. T., Spicuzza, M., and Valley, J. W.: Intratest oxygen isotope variability in the planktonic foraminifer N. pachyderma: Real vs. apparent vital effects by ion microprobe, Chem. Geol., 258, 327–337, 2009b. Kroon, D. and Ganssen, G. M.: Northern Indian Ocean upwelling cells and the stable isotope composition of living planktonic foraminifers, Deep-Sea Res., 36, 1219–1236, https://doi.org/10.1016/0198-0149(89)90102-7, 1989. Lohmann, G. P.: A model for variation in the chemistry of planktonic foraminifera due to secondary calcification and selective dissolution, Paleoceanography, 10, 445–457, 1995. Lougheed, B. C., Metcalfe, B., Ninnemann, U. S., and Wacker, L.: Moving beyond the age–depth model paradigm in deep-sea palaeoclimate archives: dual radiocarbon and stable isotope analysis on single foraminifera, Clim. Past, 14, 515–526, https://doi.org/10.5194/cp-14-515-2018, 2018. Löwemark, L.: Importance and Usefulness of Trace fossils and Bioturbation in Paleoceanography, in: Trace Fossils: Concepts, Problems, Prospects, edited by: Miller, W., Elsevier, Amsterdam, 414–427, 2007. 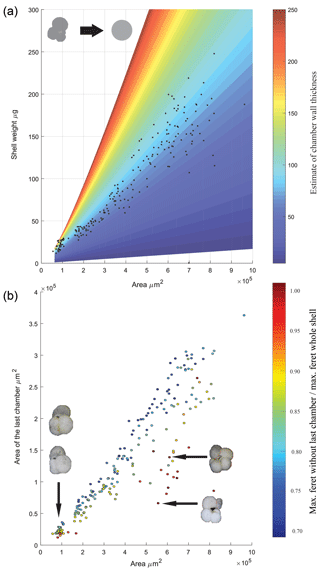 Löwemark, L. and Grootes, P. M.: Large age differences between planktic foraminifers caused by abundance variations and Zoophycos bioturbation, Paleoceanography, 19, PA2001, https://doi.org/10.1029/2003PA000949, 2004. Löwemark, L., Konstantinou, K. I., and Steinke, S.: Bias in foraminiferal multispecies reconstructions of paleohydrographic conditions caused by foraminiferal abundance variations and bioturbational mixing: A model approach, Mar. Geol., 256, 101–106, 2008. Margalef, R.: Life-forms of phytoplankton as survival alternatives in an unstable environment, Oceanol. Acta, 1, 493–509, 1978. Mari, X.: Does ocean acidification induce an upward flux of marine aggregates?, Biogeosciences, 5, 1023–1031, https://doi.org/10.5194/bg-5-1023-2008, 2008. Mari, X., Rochelle-Newall, E., Torréton, J.-P., Pringault, O., Jouon, A., and Migon, C.: Water residence time: A regulatory factor of the DOM to POM transfer efficiency, Limnol. Oceanogr., 52, 808–819, 2007. McCorkle, D. C., Martin, P. A., Lea, D. W., and Klinkhammer, G. P.: Evidence of a dissolution effect on benthic foraminiferal shell chemistry: δ13C, Cd∕Ca, Ba∕Ca, and Sr∕Ca results from the Ontong Java Plateau, Paleoceanography, 10, 699-714, 1997. Metcalfe, B., Feldmeijer, W., de Vringer-Picon, M., Brummer, G.-J. A., Peeters, F. J. C., and Ganssen, G. M.: Late Pleistocene glacial–interglacial shell-size-isotope variability in planktonic foraminifera as a function of local hydrography, Biogeosciences, 12, 4781–4807, https://doi.org/10.5194/bg-12-4781-2015, 2015. Mix, A. C.: The oxygen-isotope record of deglaciation, in: North America and adjacent oceans during the last glaciation, edited by: Ruddiman, W. F. and Wright, H. E. J., Geological Society of America, Boulder, Colorado, 1987. Mulitza, S., Arz, H., Kemle-von Mücke, S., Moos, C., Niebler, H.-S., Pätzold, J., and Segl, M.: The South Atlantic Carbon Isotope Record of planktic foraminifera. In: Use of Proxies in Paleoceanography: Examples from the South Atlantic, edited by: Fischer, G. and Wefer, G., Springer-Verlag, Berlin Heidelberg, 1999a. Mulitza, S., Wolff, T., Patzold, J., Hale, W., and Wefer, G.: Temperature sensitivity of planktic foraminifera and its influence on the oxygen isotope record, Mar. Micropalaeontol., 33, 223–240, 1999b. Olsson, R. K.: What is a kummerform planktonic foraminifera?, J. Paleontol., 47, 327–329, 1973. Ottens, J.: April and August Northeast Atlantic surface water masses reflected in planktic foraminifera, Neth. J. Sea Res., 28, 261–283, https://doi.org/10.1016/0077-7579(92)90031-9, 1992. Peeters, F. J. C.: The distribution and stable isotope composition of living planktic foraminifera in relation to seasonal changes in the Arabian Sea, PhD-thesis, Vrije Universiteit Amsterdam, Amsterdam, 2000. Peeters, F. J. C., Brummer, G. J. A., and Ganssen, G. M.: The effect of upwelling on the distribution and stable isotope composition of Globigerina bulloides and Globigerinoides ruber (planktic foraminifera) in modern surface waters of the NW Arabian Sea, Global Planet. Change, 34, 269–291, 2002. Pracht, H., Metcalfe, B., and Peeters, F.: DATA: Oxygen isotope composition of final chamber of planktic foraminifera provides evidence for vertical migration and depth integrated growth, Data set, Zenodo, https://doi.org/10.5281/zenodo.2476176, 2018. Riley, G. A., Stommel, H., and Bumpus, D. F.: Quantitative ecology of the plankton of the western North Atlantic, B. Bingham Oceanogr. C., 12, 1–169, 1949. Ruiz, J., Macías, D., and Peters, F.: Turbulence increases the average settling velocity of phytoplankton cells, P. Natl. Acad. Sci. USA, 101, 17720–17724, 2004. Schiebel, R. and Hemleben, C.: Planktic Foraminifers in the Modern Ocean, Springer-Verlag, Berlin Heidelberg, 2017. Scussolini, P., van Sebille, E., and Durgadoo, J. V.: Paleo Agulhas rings enter the subtropical gyre during the penultimate deglaciation, Clim. Past, 9, 2631–2639, https://doi.org/10.5194/cp-9-2631-2013, 2013. Shackleton, N. J.: Oxygen Isotope Analyses and Pleistocene Temperatures Re-assessed, Nature, 215, 15–17, 1967. Shigesada, N. and Okubo, A.: Analysis of the self-shading effect on algal vertical distribution in natural waters, J. Math. Biol., 12, 311–326, 1981. Shuxi, C. and Shackleton, N. J.: New technque for study on isotopic fracionation between sea water and foraminiferal growing process, Chin. J. Oceanol. Limn., 8, 299–305, 1989. Siegel, D. A., Buesseler, K. O., Doney, S. C., Sailley, S. F., Behrenfeld, M. J., and Boyd, P. W.: Global assessment of ocean carbon export by combining satellite observations and food-web models, Global Biogeochem. Cy., 28, 181–190, 2014. Spero, H. J.: Life history and stable isotope geochemistry of planktonic foraminifera, The Paleontological Society Papers, 4, 7–36, 1998. Spero, H. J. and DeNiro, M. J.: The influence of symbiont photosynthesis on the δ18O and δ13C values of planktonic foraminiferal shell calcite, Symbiosis, 4, 213–228, 1987. Spero, H. J. and Lea, D. W.: Intraspecific stable isotope variability in the planktic foraminifera Globigerinoides sacculifer: Results from laboratory experiments, Mar. Micropaleontol., 22, 221–234, 1993. Spero, H. J. and Parker, S. L.: Photosynthesis in the symbiotic planktonic foraminfera Orbulina universa, and its potential contribution to oceanic primary productivity, J. Foramin. Res., 15, 273–281, 1985. Srinivasan, M. S. and Kennett, J. P.: Secondary Calcification of the Planktonic Foraminifer Neogloboquadrina pachyderma as a Climatic Index, Science, 186, 630–632, 1974. Sverdrup, H. U.: On conditions for the vernal blooming of phytoplankton, Journal du Conseil Conseil Permanent International pour l'Exploration de la Mer, 18, 287–295, 1953. Takagi, H., Moriya, K., Ishimura, T., Suzuki, A., Kawahata, H., and Hirano, H.: Exploring photosymbiotic ecology of planktc foraminifers from chamber-by-chamber isotopic history of individual foraminifers, Paleobiology, 41, 108–121, 2015. Takagi, H., Moriya, K., Ishimura, T., Suzuki, A., Kawahata, H., and Hirano, H.: Individual migration pathways of modern planktic foraminifers: Chamber-by-chamber assessment of stable isotopes, Paleontol. Res., 20, 268–284, 2016. Trauth, M. H., Sarnthein, M., and Arnold, M.: Bioturbational mixing depth and carbon flux at the seafloor, Paleoceanography, 12, 517–526, 1997.
van Sebille, E., Scussolini, P., Durgadoo, J. V., Peeters, F. J. C., Biastoch, A., Weijer, W., Turney, C., Paris, C. B., and Zahn, R.: Ocean currents generate large footprints in marina palaeoclimate proxies, Nat. Commun., 6, 1–8, 2015. Vetter, L., Spero, H. J., Eggins, S. M., Williams, C., and Flower, B. P.: Oxygen isotope geochemistry of Laurentide ice-sheet meltwater across Termination I, Quarternary Sci. Rev., 178, 102–117, https://doi.org/10.1016/j.quascirev.2017.10.007, 2017. Wilke, I., Bickert, T., and Peeters, F. J. C.: The influence of seawater carbonate ion concentration [CO32-] on the stable carbon isotope composition of the planktic foraminifera species Globorotalia inflata, Mar. Micropaleontol., 58, 243–258, https://doi.org/10.1016/j.marmicro.2005.11.005, 2006. Wit, J. C., Reichart, G. J., Jung, S. J. A., and Kroon, D.: Approaches to unravel seasonality in sea surface temperatures using paired single-specimen foraminiferal δ18O and Mg∕Ca analyses, Paleoceanography, 25, PA4220, https://doi.org/10.1029/2009PA001857, 2010. Wit, J. C., Reichart, G. J., and Ganssen, G. M.: Unmixing of stable isotope signals using single specimen δ18O analyses, Geochem. Geophy. Geosy., 14, 1312–1320, 2013. Wycech, J. B., Kelly, D. C., Kitajima, K., Kozdon, R., Orland, I. J., and Valley, J. W.: Combined Effects of Gametogenic Calcification and Dissolution on δ18O Measurements of the Planktic Foraminifer Trilobatus sacculifer, Geochem. Geophy. Geosy., 19, https://doi.org/10.1029/2018GC007908, 2018.